Maurizio Sarri has revealed the touchline conversation he had with Jurgen Klopp that saw the Chelsea boss quiz the German over why he was smiling despite being behind. Liverpool were trailing the Blues 1-0 in September’s Premier League clash at Stamford Bridge after Eden Hazard smashed home past Alisson Becker in the first half. The Reds did manage to grab a point from the game, however, as Daniel Sturridge’s late strike from distance got the better of Kepa Arrizabalaga to ensure it would finish 1-1. 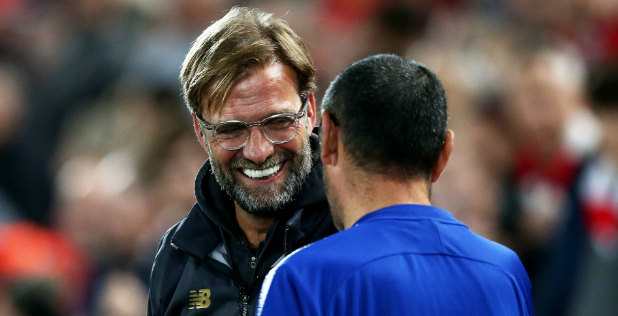 And Sarri has shared a curious discussion he had with Klopp while the Reds were 1-0 down, expressing his surprise that the former Dortmund boss was still smiling despite having to chase the game. He told Corriere dello Sport: “There are times when a great show convinces you to put aside any regrets. Even if you suffer a goal in the last minute or the fifth minute of injury time. And that [the game at Stamford Bridge against Liverpool] had been an extraordinary show. Sarri also discussed his favourites for the Champions League, insisting that he expects it to be a two-horse race between Juventus and Manchester City. When asked if Juve and Real Madrid were the two main condenders, he said: “No, Juve and Manchester City. I’ve always thought that Guardiola’s team is maturing to make the final step at European level. Chelsea, who themselves are competing in the Europa League having missed out on Champions League qualification, are on an 11-game unbeaten run in all competitions and find themselves second in the Premier League table.